“Innovation” is a word that you’ve heard thrown around a lot in the past year; it seems like every policy, plan, or firm has to be “innovative” or “strategic” in order to stay relevant. Are these becoming hollow buzzwords, void of actual intent? The government’s recent focus on innovation in Budget 2018 and the Fall Economic Statement 2018 raises the question of how word is being used, and whether it is simply too much. Innovation was a key tenet of Budget 2018: the word “innovation” was used 179 times in various contexts. For example, it was used in relation to women at work, competition, and employment insurance. With the budget weighing in at 369 pages, this means that “innovation” was used roughly every other page. It was a similar story for “strategy” (107 repetitions). 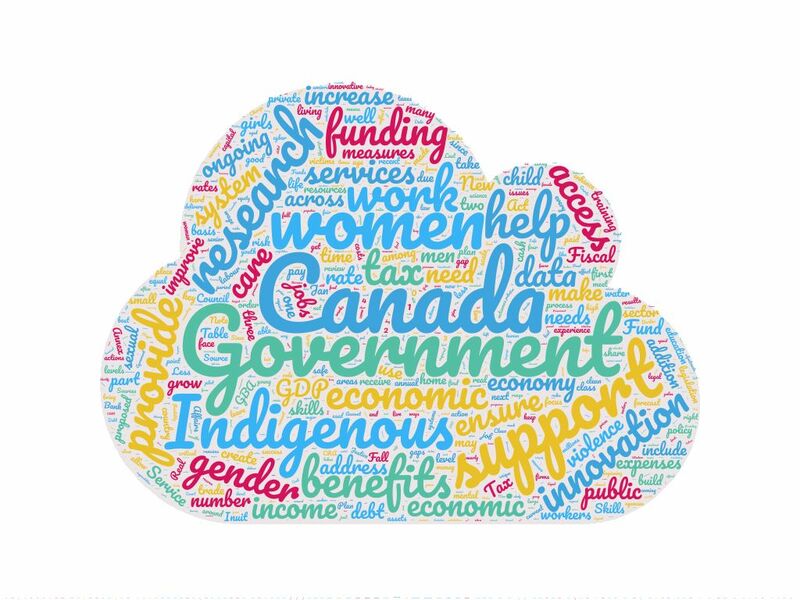 Overall, the most used words of the budget reflected its main focuses: women, Indigenous, research, gender. But why? Why say “strategy” over and over instead of “plan”, or “innovation” instead of “change”? It all comes down to the importance of language. The Sapir Whorf hypothesis states that language influences thinking and our perception of the world , and the government wants its policies presented in the most favourable light possible. Certain words can have more positive connotations, like how “strategy” evokes a sense of sophistication and precision when compared to the word “plan”. Wording is extremely important for creating a positive public opinion. Any aspiring employee could probably already tell you as much. A review of the top words used on LinkedIn in Canada in 2016 yields similar results of repeated buzzwords. “Strategic” is the 4th most used word on profiles , and the majority of the other words are equally generic. In this way, government policies are marketing themselves much like prospective workers, and like resumes, buzzwords are only effective if you back them up with concrete examples. Buzzwords generally have a negative connotation because a word often loses its true technical meaning through fashionable use. In addition to being harsh on the eyes and ears, using the same word repeatedly can be detrimental to clear and effective communication. Overuse of generic buzzwords can lead to miscommunication, confusion, and interest fatigue as it will no longer be evident exactly what you are trying to say . What is the difference between a strategy and a plan? What does innovation really mean? Intent is lost in the haze of hollow words. The issue comes down to whether these words are being used justifiably. The use of buzzwords isn’t inherently bad so long as they’re used sparsely and appropriately. This leads to the question of whether or not “innovation” has become nothing more than a buzzword to the Canadian government. Their vision of innovation, as described in Budget 2018, is a knowledge-based global economy revolving around the translation of ideas into commercial value . They laid out a series of measures designed to support this vision, including investing in Canadian researchers and protecting intellectual property . These intentions are well and good, but how has it translated to real action? A look at the Fall Economic Statement 2018 reveals the progress of several government policies undertaken in the name of innovation. Continued funding for the Strategic Innovation Fund means that Canadian innovators are getting the investment support they need, while the introduction of GBA+ (Gender Based Analysis +) to the fund only serves to strengthen its value to the Canadian economy. GBA+ is the way in which the government is beginning to analyze how policies and programs can affect different people in different ways depending on gender and other interrelated factors . This is of paramount importance to innovation because inclusiveness encourages more participation and contribution from all of Canada’s demographic groups. Innovation, at its core, is about bringing new ideas and diverse perspectives to the table, and GBA+ does exactly that. Some other key investments for innovation are the additional $50M in venture capital made available to clean energy technology firms as well as the Innovation Supercluster Initiative, designed to facilitate innovation across public and private sector actors . Furthermore, the creation of innovative ideas is backed up by an Export Diversification Strategy to increase exports and diversify oversea trade . The Government of Canada’s support for innovation goes beyond some of the points highlighted in the Budget 2018 and Fall Economic Statement 2018. Strong, Secure, Engaged, Canada’s defence policy, has a focus on innovation, as evidenced by the IDEaS program. IDEaS seeks to provide the resources, collaborative structure, and access to DND S&T members needed for the success of Canadian defence and security innovators . In a similar vein, the National Research Council’s Industrial Research Assistance Program helps firms develop technologies and commercialize them internationally with the monetary, advisory, and structural resources they need . These initiatives champion the idea of innovation as the development of marketable ideas, an important tool for keeping Canada competitive in today’s increasingly knowledge-based international economy. Innovation evokes a sense of being better, often without specifying exactly how. Canada has so far successfully avoided this trap; its ongoing commitment to forward-thinking policies, programs, and investments shows how “innovation” is not merely a buzzword to be trifled with. It is absolutely crucial that it stays this way given innovation’s pertinence to the success of any economy. We must keep pushing ahead, encouraging a country of innovators present and future to flourish.